HTML Executable is a versatile electronic publication and ebook authoring solution that provides you with powerful options and features, allowing you to achieve simple or complex projects. you want to show off your work without the slightest chance of anyone reading your html code or stealing images. you want to avoid customers from sharing your PDF documents. you need to show a website to someone who doesn't have a browser or you want people to see the website exactly as it looks in Internet Explorer, but offline. you search for an easy and fast way to distribute your documents, HTML pages, PDF, educational materials, courses, catalogs or websites. create eye-catching ebooks and sell them. avoid the Flash Player Security Warning dialog box that appears when running websites from your hard drive (local websites). avoid the "Click to activate and use this control" problem of Internet Explorer. make HTML-based applications with scripting support. protect your PDF files from being copied. compile your PDF collection into one single archive. you want to archive your websites for backup purposes. If any of the above applies to you, you need HTML Executable. 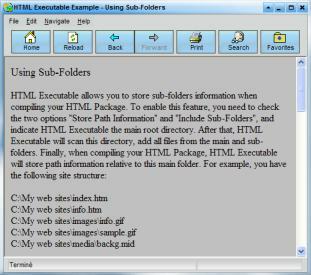 HTML Executable turns websites, HTML documents and PDF files into stand-alone Windows applications named ebooks in .exe format. These ebooks are similar to web browsers: they allow your readers to navigate through your compiled website as if they were surfing online. You then simply distribute this .exe file to end users: by running it, the latter can navigate through your website without needing any additional program or your original website source files! HTML Executable is a feature-packed HTML compiler which allows you to customize ebooks and publications from A to Z. The following tour does not include all of its features but it shows the main ones. You can also jump to online help where each feature is described in details.